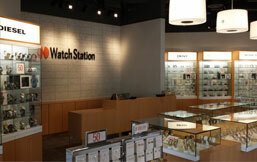 Watch Station creates the most appealing and dynamic shopping experience in the world of iconic watch brands. We curate the watch world by creating amazing stories about brands, platforms, trends and watch culture. We strive to create personal connections with our shoppers, so that they always leave feeling great about how they look, more knowledgeable about watches, and savvier about the fashion world. We are committed to answering questions and addressing comments in a timely fashion. Feel free to contact us by email, phone, or mail using the link below.